1. High level noble children with an active conscience begging from lesser nobility on behalf of the poor, knowing that the lesser nobility would never dare insult their betters by refusing to donate to charity even though those same would have had genuinely poor beggars flogged for approaching them. Perhaps they approach the party -- or, if the party has any young nobles in it, invite them to join in. 2. A particularly miserly and unethical merchant supplements his income by disguising himself as a beggar on Church days, chuckling spitefully to himself that every donation he gets is one that members of the genuinely poor will miss out. He also claims to his priest that he is "working with the poor" to explain not attending Church that day. He will certainly be happy to cheat the party if he can! 3. On Topsy Turvy Day, the wealthy have to beg for their day's food while their estates pay for a feast for the impoverished in the city and public baths. The DM might arrange for this to happen if the party is currently impoverished and in need of a good meal. 4. A noblewoman abandoned by her powerful husband is forced to beg to survive : by Medieval law, she kept only her clothes and jewelry, and her husband maliciously arranged to have her jewelry stolen because he wants to see her die in poverty. No one dares hire her for anything she can do (such as tutoring) because that would invite her husband's wrath. If the party has a noble in it, she might be the aunt of a party member. Alternatively, she could hire on to teach literacy to a party member, not realizing the party does not know her husband will be furious at them for hiring her. Religious lepers revel in their catching of the 'holy' disease and their soon to come 'ascension'. They try to spread the gospel and their sloughing skin. (Well that escalated quickly). Wealthy begging is a noble trying to get investment partners. Or a beggar king hiding his success from the marks. @V.A. : Yeah, I was thinking the wealthy might be begging for something other than money, like participants in a crusade maybe, or rjschwarz'/Socrates_Is_Mortals' ideas. Or, isn't there a Sherlock Holmes story about rich people pretending to be beggars for the thrill of it? Aren't there fairy tales in which the king begs for a hero to rescue his daughter or son from the wicked dragon / ogre-mage / sorceress / troll, a monster so terrifying even royal mandates can not find a champion? Out of curiosity, what would the blank cells in the second column mean? I took the blanks as reflecting the previous filled cell, so a roll of 3 would be peasants. And by adjusting the blank cells in this column, possibly even eliminating some social classes, the table might be more or less likely to give certain results for different wards/quarters of the city. Not so likely to find a city/state ruler in Tanners' Row. Now to create a bustling feel, the frequency of encounter rolls might need to be set somewhat high. How to do this without it simply becoming an annoyance to the PCs? 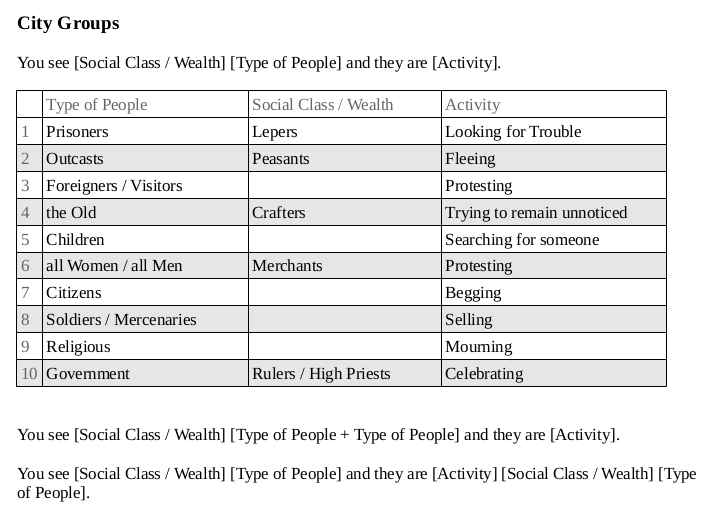 @ KyleYeah, I was just treating that column as a measure of wealth from 1-10 and the filled spaces are some examples. I didn't want to give the idea that a 1 will always and only be lepers. @DungMeister: I would just roll them whenever anyone in the party is out and about. The trick is these aren't aimed at the players, they are just things people see moving around the big city. It doesn't even have to turn into any roleplaying if the players are more interested in getting to where their going. But then these are there if they want to interact too. One of my cleric players ran into a bunch of lepers, managed to heal one, and converted the lot to his religion.